Let's talk about interior; industrial with a touch of vintage and mismatched materials. From chairs to chandeliers and utensil canisters, it may look very random but it's oh-so-very detailed. It reminds me so much of the 90s' and cafeterias around the streets but with a touch of sophistication. Everything was set-up for us and we sat on the corner overlooking the boulevard and Burj Khalifa. They gave us a set-list of food we'll be devouring so all we had to do was sit back, relax, and enjoy the day. We took that chance to take pictures around the place and obviously a very cheesy shot. Oh you know, #relationshipgoals while sippin' on some fresh pineapple juice (Julian's) and iced coffee (mine). See a huge difference there? That was just starters. Let's proceed with the Main Course, shall we? But wait, there's more. We won't let dessert pass and like what everyone says (yes, even the gym enthusiast ones haha), there's always room for dessert. Or, always make room for dessert. There's no better way to describe desserts than "go taste it for yourself." 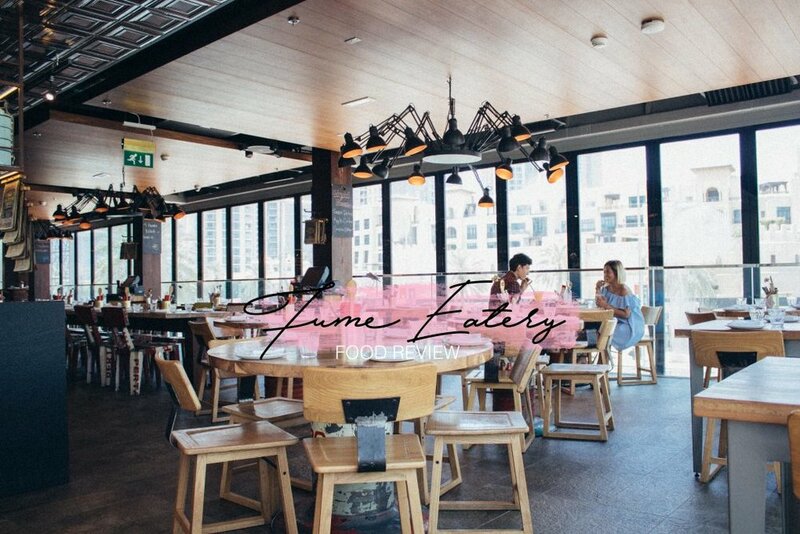 We love Fume Eatery and I'm sure you guys will love it too! They have two locations here in Dubai: Downtown Dubai and Pier 7. Make sure to visit and don't let this blog just be a blog. Let it be an experience too. If you ever visit them, let me know or bring me with you!